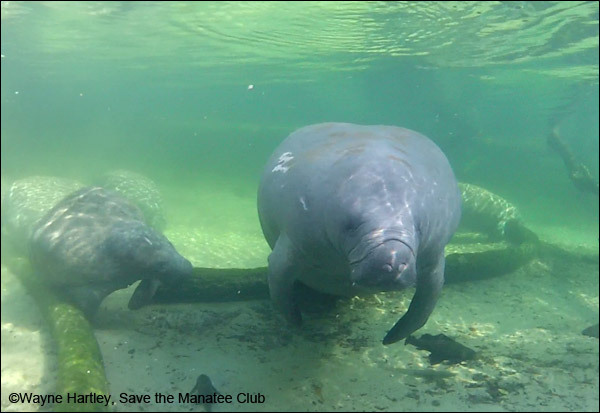 Special thanks to Save the Manatee Club staff members Wayne Hartley, Manatee Specialist, and Cora Berchem, Manatee Research & Multimedia Specialist, for their work to document the manatees this season and provide us with all the wonderful photos, video, and information. See highlights of the 2018 – 2019 season by going to our Webcam page. 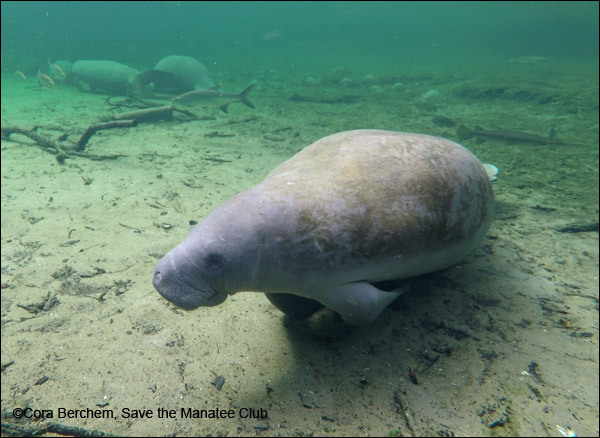 A Day at Blue Spring – Time-Lapse Video: Enjoy 6 1/2 hours of manatee movement in the protected warm-water winter refuge at Blue Spring State Park on January 16, 2019 in less than 4 minutes! Watch for the arrival of the research canoe at about 1:30. Recorded with our above-water webcam. 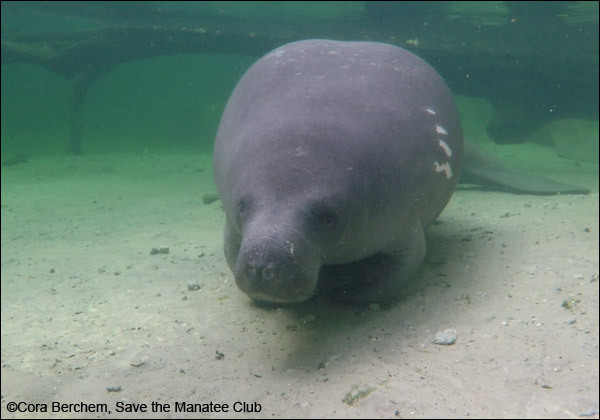 Video ©Save the Manatee Club. Merlin surprised us with an unexpected late season visit on March 30th! We had heard from fellow researchers that he was seen at other springs this winter season, but it was his first visit to Blue Spring. Flash also made his first appearance of the season at Blue Spring on March 20, 2019. He has been hanging out with Brutus and Merlin at other springs, so it was good to see him! Aqua has a calf with her this winter! Mom and calf were both spotted at Blue Spring on January 25, 2019 and have made several visits this season. 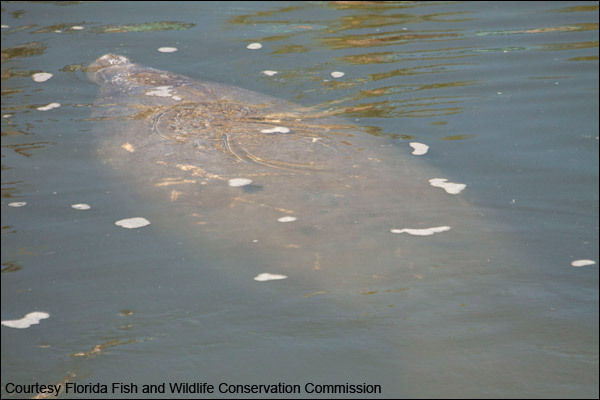 Watch manatee “U34/18” with her calf. She is later joined by a second calf. 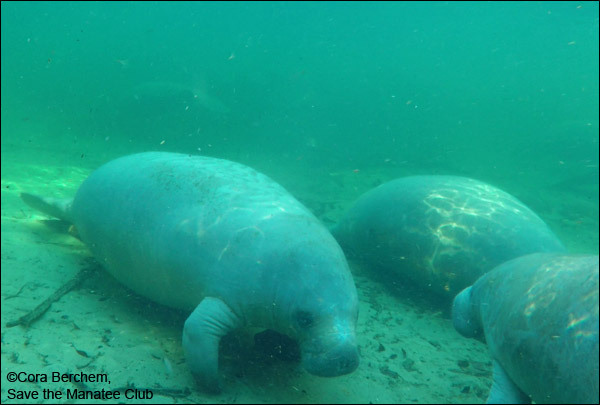 Captured on the above-water cam during the 2018 – 2019 Manatee Season at Blue Spring State Park. Video ©Save the Manatee Club. Cora Berchem, our Manatee Research & Multimedia Specialist, snapped this lovely photo of Moo Shoo on January 23, 2018 at Blue Spring State Park. Moo Shoo made her first visit to the park on November 27th, along with Lucille and Phyllis and her calf. 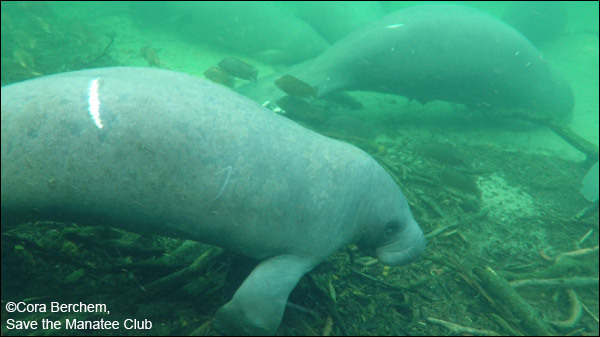 Whiskers hangs out with fellow manatees at Blue Spring on January 21, 2019. He appeared at Blue Spring on December 6th, along with fellow adoptee Nick. A handsome photo of Rocket, who was spotted several times at Blue Spring this winter. Here he is on January 28, 2019. 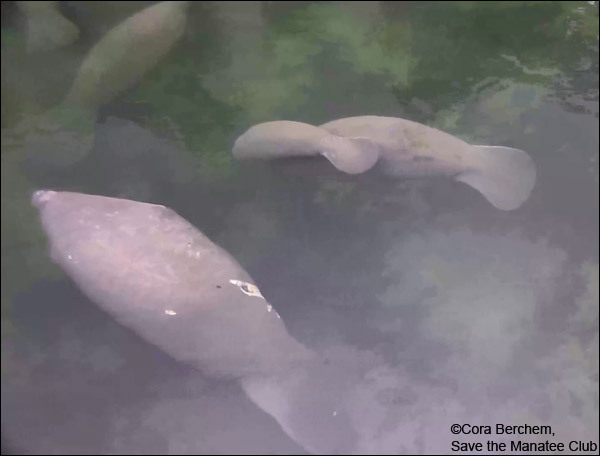 A wonderful video of a large manatee cavorting group at Blue Spring State Park on January 22, 2019, including manatees Frank, Ham, S74/18, Rocky, U37/18, and others. Recorded with our underwater webcam. 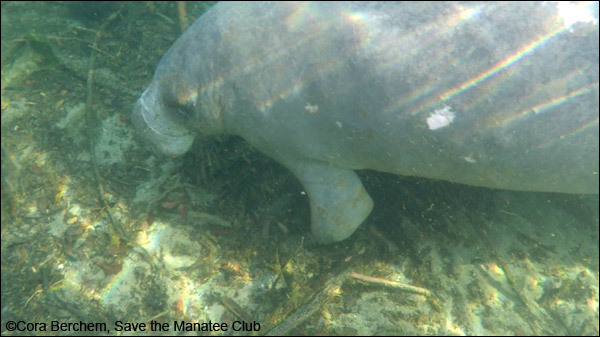 Video ©Save the Manatee Club. Here’s a glimpse of the distinctive tail that identifies Vector. 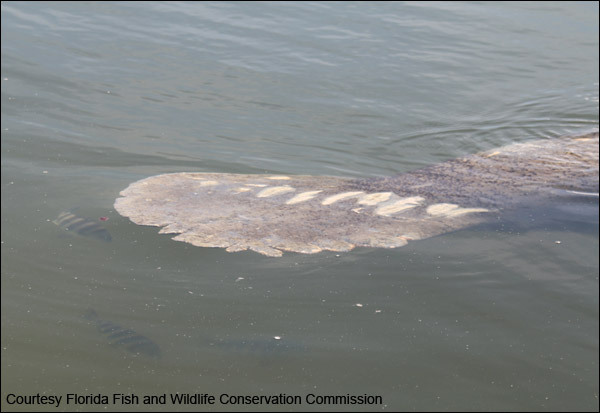 Florida Fish and Wildlife Conservation Commission (FWC) researchers spotted Vector in late January at Progress Energy’s Bartow power plant and in early March at the TECO power plant in Apollo Beach, Florida. FWC reports that Flicker was also seen at the Progress Energy Bartow power plant in late November and late January and at the TECO power plant in Apollo Beach in mid-January. 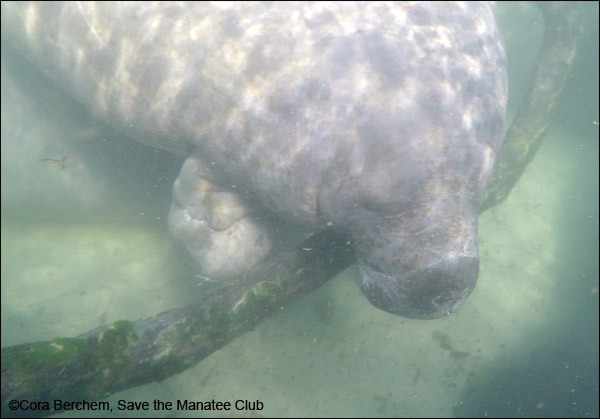 Enjoy this fun video of manatees munching away on a branch of a fallen oak tree at Blue Spring State Park in early March 2019. Mmm, mmm good! Video ©Save the Manatee Club. 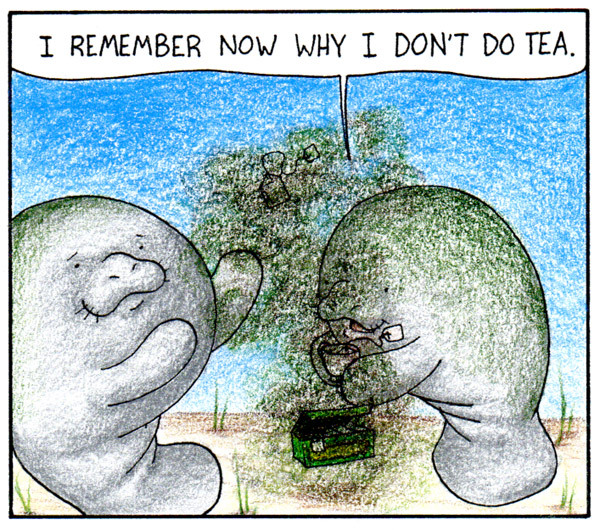 Recorded during the Club’s morning research or “manatee roll call.” Video © Save the Manatee Club, 2019. Showing the distinctive scar that helps identify him, Philip visits Blue Spring on January 23, 2019. He came in for the season on December 2nd, along with fellow adoptee Rocket. This nice photo of Nick was captured from GoPro footage on January 22, 2019. He made his first visit to Blue Spring on December 6th. A mom and calf leisurely travel the Blue Spring run. Captured on the above-water cam on February 2, 2019. 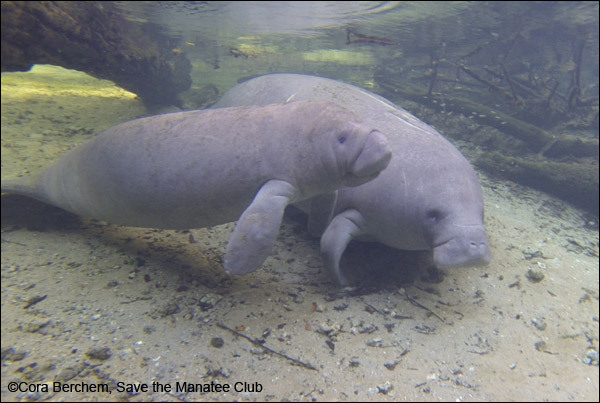 Video ©Save the Manatee Club. If you look closely, you can see Lucille’s flipper that is scarred from monofilament entanglement. This image of Lucille was taken from GoPro video footage on January 18, 2019. Our above-water webcam shows a visit from Lily (at left) shortly after the new year on January 3, 2019. She was the first adoptee to visit Blue Spring on November 17th and was still making visits near the end of March. 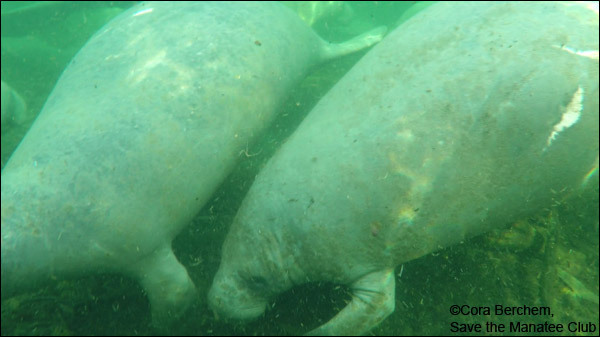 More manatees happily cavorting in the protected warm-water sanctuary at Blue Spring State Park in March 2019! 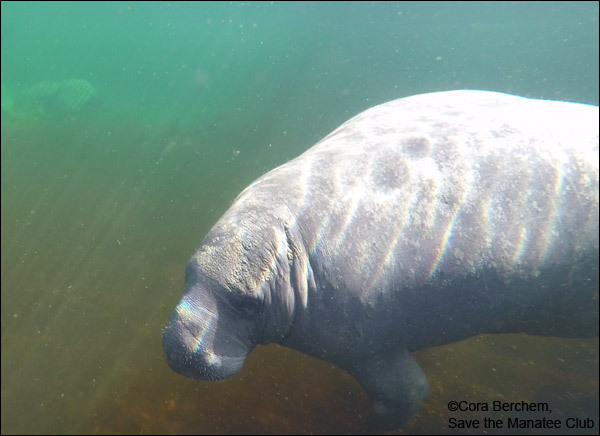 Toward the middle of the video, SMC manatee adoptee Doc joins in! See if you can identify him. And be sure to listen for the manatee chirps and squeaks. 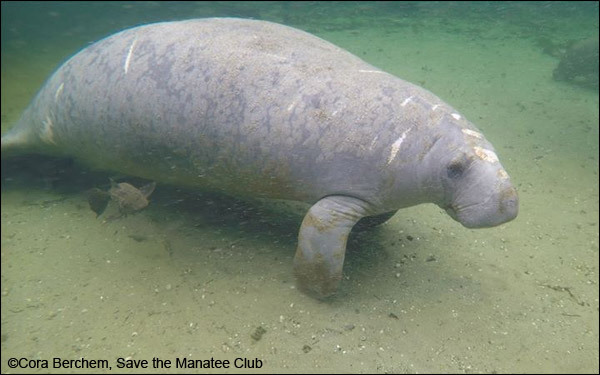 Video ©Save the Manatee Club. Lenny (at right) and pal at Blue Spring on January 22, 2019. Lenny came in for the season on November 29th, along with fellow adoptees Doc and Paddy Doyle. A cool spell brought Howie to Blue Spring on March 8, 2019. He was the last adoptee to appear at Blue Spring for the start of the season — bringing up the rear on December 17th. He made up for his late start by visiting the park in late March.